I’ve heard of arm bands – they wore them during the ceremony. “Hoops of birch wood around the neck and wrists, with various patterns and figures cut on them” were Koyukon emblems of mourning for the dead, according the Smithsonian collector, William H. Dall, who purchased this pair along the Yukon River in 1868. 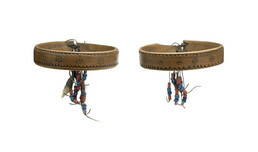 The hoops are engraved with images of caribou and decorated with Russian-period trade beads. A set of caribou teeth hangs from one of the hoops. Aron Crowell: These are identified as “Koyukon mourning bracelets,” so associated with grief. Trimble Gilbert: Just like arm bands used to be? Eliza Jones: I heard of arm bands and they wear it during the ceremony. Trimble Gilbert: Yes, remember they used to have arm bands right here? Judy Woods: Oh, I know. Trimble Gilbert: Yes, chief. I see the chief wear that. . . .
Aron Crowell: Are there any customs when you’re grieving for someone who’s passed away that could be associated with these? Eliza Jones: I’ve heard of arm bands, but I never knew when they would have worn it. Judy Woods: I never heard about that. They used to have arm bands that was made [for around bicep] too. Trimble Gilbert: I heard about feather with arm band too. And also some warriors, they put a sharp bone right there [elbow]. Eliza Jones: Oh my, it has the designs on there, old-time beads. . . . This (indicates fringe) part is probably either thin moose hide or caribou. Judy Woods: Mm-hmm, look like caribou. Eliza Jones: Old-time trade beads. Judy Woods: Yes. And there’s a little jaw. Trimble Gilbert: . . . Animal jaw, lower jaw. . . .
Eliza Jones: One, two, three, four, five, six—actually both sides have seven strands of these old-time trade beads. . . . So this one has a drawing of an animal. And this one has dots on it, but not the drawing. You see, drawing of the animal must have represented something. Judy Woods: Yes, that’s why there’s jaw on there. Eliza Jones: Caribou maybe, these rawhide strings.